On this page you will learn all about how to Renew your Ads. It is easy and free! You can Renew your ads after 90 days, when your ads have expired. You Renew your ads from My Dashboard. If you have problem to Login please Recover﻿ ﻿your password. Here do you see the relist link from My Dashboard on a desktop computer. If you want to Renew your ad on you ﻿﻿mobile phone or tablet ﻿﻿﻿you will find the relist link by click on the + icon. Visit My Dahsboard - If you need to login, simply do that. If you have forget your password you can fix that here. 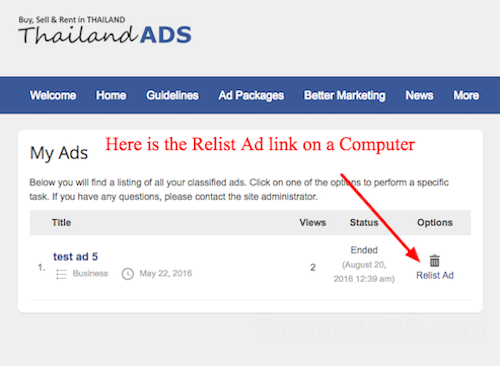 Find relist the ad link. See the pictures above, how you can find the link from a computer or from a mobile. First you will come to the category page, you can see that your category is already selected for you, JUST CLICK NEXT. You will now see your ad with all text pictures etc, click next again and follow the process until you ad is online again. Your ads are online again for another 90 days! You can also visit and l﻿﻿earn about ﻿all servi﻿﻿ces.